Ghee is purified butter.It's made by first skimming the cream from milk,then churning the cream into butter,and finally heating the butter slowly until all of the moisture is driven off and its protein solids have separated,The result is ghee>the essence of milk,and of all cooking mediums it is by far the best.For our purposes,we buy the unsalted butter at the supermarket ,and start from there.The ghee Krsna enjoys has many attributes besides its fine taste.You can heat ghee to high temperatures and it won't bubble or smoke,because the water (which bubbles at 212F)and the protein solids (which burn at 250F)have been removed.So besides being excellent for mixing into simple cooked food to bring out great flavor,ghee is ideal for sauteing,braising,and both shallow frying and deep frying.Ghee also keeps well :sealed and stored in a cool ,dry cupboard,it will last two or three months;frozen ,it will last up to six months or more.Ghee is also high in vitamin A.So it's desirable both for cooking and as a dietary component.When you're making your first batch of ghee--the butter is ever so gently simmering and the protein solids are silently settling--you might meditate on an analogy Srila Prabhupada once gave"Ghee is present in butter,but to get ghee from butter you must follow the procedure that's given by an experienced cook.Similarly,Krsna is in everything by his various energies,but to realize His presence and to develop our love for Him,we have to follow the procedure given by the bona fide spiritual master. 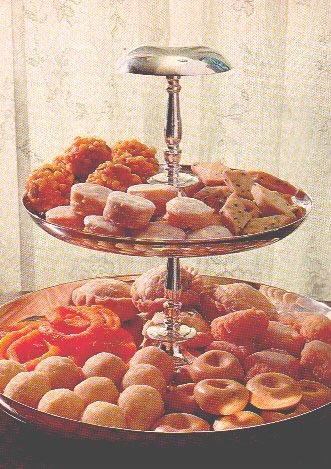 "I have started with milk,the miracle food,which yields cheese,cream, yogurt,butter and ghee,(the golden liquid in the two jars above),because it is the starting point of cooking for God(KRSNA),and is the main ingredient in the many milk sweets,we make for offering to Krsna,just like it was made 5000 years ago,while Krsna walked this earth.So after learning how to make ghee,we will learn how to make milksweets,and wonderful vegetable preparations,that we make to please our Lord Krsna ,and to take His remnants,and enjoy Prasadam,(Krsna's Mercy). Ghee (Stove Method) 1 Place l to 5 pounds of butter into a large, heavy saucepan. Heat over medium-high flame, stirring occasionally, until the butter melts and comes to a boil. 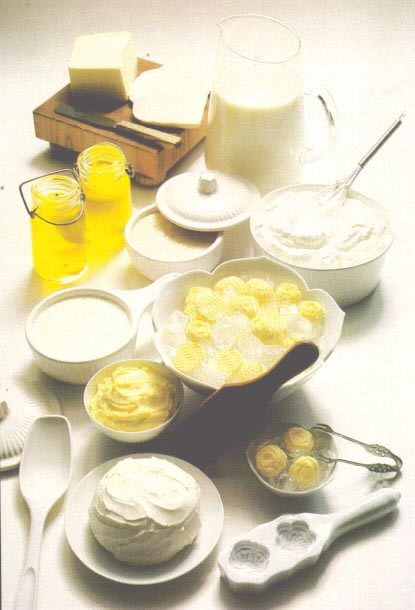 When the surface of the butter is covered with a frothy white foam, reduce the heat to a very low temperature. Simmer the butter, uncovered and undisturbed, until the gelatinous protein solids have collected on the bottom of the pan and a thin layer of pale golden, crusty solids has formed on the surface. 2 With the wire-mesh skimmer skim off the thin crust on the surface. How long you need to cook the ghee depends on how much you make,but the ideal finished ghee is crystal-clear and pale in color. Ghee becomes dark when cooked over too high a flame or cooked too long. You may skim off the foam as it forms and hardens and save it in a small container. 3 Ladle the clear ghee into your can, jar or crock through a large sieve or strainer lined with 3 thicknesses of cheesecloth or 1 thick- ness of good quality paper towel. (Don't use a paper towel with plastic reinforcing threads: the plastic will melt.) When you come near the solids on the bottom of the pan, stop before you disturb them. 4 Pour one or two cups of cold water into the pan and refrigerate for a few hours, until (Stove Method)	Yield Time 1 hour	(1)l/2cups (¾ lb.) 1hour	3c. (1¼ lbs.) 2 hours	5 c. (2¼ lbs.) 3 hours	9 C. (4 lbs.) 5 to 5½ hours	17 c. (7 1/2 lbs.) the ghee floats to the top and forms a solid layer. You can lift it off in a single piece and wash it under cold running water. Pat the ghee dry with a paper towel and add it to the ghee that has already been strained. 5. Cool the ghee to room temperature, uncovered. Store in an airtight container in a cool, dark, dry place, or in a refrigerator. Ghee that has been properly purified, filtered, and stored will last for months. 6. Discard the remaining water in the pan and combine the remaining solids at the bottom with the foam skimmed off from the surface of the ghee. You can use the solids as a sandwich spread or mix them into cooked vegetables, soups, and other dishes. Refrigerated,the soilds will keep for only 4 or 5 days,use them quickly. Done! Just click on frog to write to me if you have any Questions, advice, all is welcome, In your service ,krsnajoe@hotmail.com --I'll write back to all interested in Krsna ,And anyone who wants a catalog or a Back to Godhead ,Please let me know,your servant, krsnajoe@hotmail.com Write me at krsnajoe@hotmail.com,for any questions,or Help!